Today I'm going to do a post on all of the shoes I've been drooling over for the past week - basically shoes I can't afford but wish I had. I've always thought good shoes are so important. They're essential in completing your overall look and there's no doubt that a fab pair of heels can make you feel that extra bit better about yourself and of course, bring out your inner Carrie Bradshaw (well, we can dream). This pair of ZARA strap heels are the epitome of simple and chic. They are perfect for the all white everything trend if worn with a white only outfit. Or you could pair these with black skinny jeans, an oversized shirt or tee and statement necklace for a laid-back yet stylish monochrome going out look. Sorted! These babies are amazing! Can you picture the likes of Katy Perry wearing these?.. 'Cause I can! The quirky clashing prints and colours drew me to these wedges when I was scrolling through Office's website. They have a 16cm heel (yes, I know) but the platform is 7cm so it makes it that lil bit easier for you to totter around in. ~The higher the heel, the closer to heaven, after all.~ You could continue on the colour block/ pattern clash look of the shoes with your outfit to add a bit of kookiness or you could let the shoes do most of the talking and go for a simple all black outfit. Either way, you are bound to get heads turning. 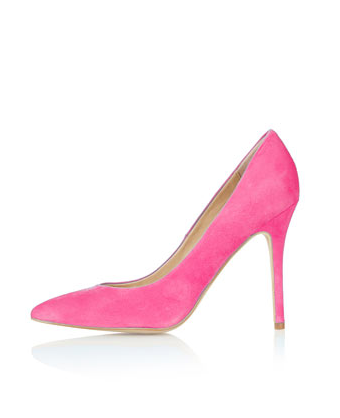 And last but not least, these hot pink suede court shoes are somewhat of a classic. Pointed courts are making a comeback and are definitely having a fashion moment this summer. What I love about these shoes is that they go with practically everything - whether it's a pair of boyfriend/skinny jeans, a skater skirt or pencil dress. The hot pink colour of these are sure to inject a bit of colour and life into any plain outfit. Pop these on with whatever you're wearing and you're ready to go! I hope you enjoyed reading about my fave shoes of the moment. I might make "Tuesday Shoesday" a weekly thing because as you can probably tell, shoes make me happy. awwwww lose white strappy ones are sooo nice i NEED the for the summer they will go with everything! I am absolutly obsessed with Aldo shoes and of course a matching bag is essential haha. I love the first shoes! I never thought I'd like white shoes but these look so classy! The pink courts are lovely! OH I am your new follower as well. Great shoe picks!!!! My favorite is #1....then #3. Now following you.